To unsubscribe, reply to newsletter@saltonseadocumentary.com with "unsubscribe" in the subject line. To subscribe, write the same email but say in big letters: SUBSCRIBE. As the traditional travel season of the Salton Sea begins to draw to close, this is one of the last weekends you can head out to the Sea and still go outside and have the temperatures be below 100 degrees. 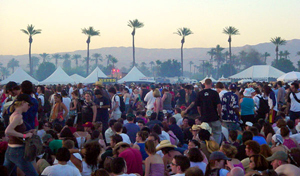 Plus, if you happen to head to the Salton Sea this weekend, you’ll get the added bonus of the happenings of the Coachella Valley Music & Arts Festival, which is taking place just north of the Sea on April 25th through the 27th. This festival is HUGE, with acts like Prince, Roger Waters, the Verve, and countless others rockin’ out in the blistering 95 degree heat. In fact one of the best places to stay during the festival is to camp at the Salton Sea State Recreation Area. It is cheap and you can always cool down with a dip in the Salton Sea. Maybe we will even see you there! So with the Coachella Valley heating up this time of year, people at the Salton Sea generally have two choices: pack up the golf cart and head north OR turn on the air con, grab some beer, and get ready to watch some DVDs! Recently “Plagues & Pleasures on the Salton Sea” was featured as part of the Ironweed Film Club, a monthly progressive film festival on DVD. Even before being chosen for the series, we were long time members and had already been enjoying their DVDs. Each month they choose 2 or 3 socially-conscious, political and environmental docs with interesting stories and unique points of view. We think they are great because you never know what will show up in your mailbox each month. Anyhow, in celebration of Earth Day, Ironweed has decided to give away copies of “Plagues & Pleasures” to any new subscribers to the Ironweed Film Club. Basically, if you subscribe now the first month is FREE and you only pay $2.95 for shipping & handling, plus you’ll get a free copy of “Plagues & Pleasures” and April’s DVD of the month. Afterwards, if you continue your subscription, each month you’ll get a DVD of 2 to 3 great documentaries for only $14.95 a month. And yeap, you can cancel at anytime. CLICK HERE to begin your Ironweed subscription. Favela Rising: Winner of 24 film festival awards, this music-filled documentary follows a heroic leader working toward social change in the slums of Brazil. The Breast Cancer Diaries: A local news reporter chronicles her unexpected, powerful journey through breast cancer at age 38. Small Town Gay Bar: A hilarious and thought provoking look at several small gay bars in the rural south. The Future We Will Create: Take a fascinating behind-the-scenes look at the legendary TED Conference (Technology, Entertainment, Design), where some of the world's most brilliant innovators share their plans for creating a better world. The War Tapes: Three national guardsmen film their day-to-day lives in Iraq. Your membership also includes access to a members-only online community where you can rate and talk about the films. In addition, they couple targeted non-profit organizations with the films so you can get involved in a particular issue if the films move you to take action. We are currently working on a full new issue of the Salton Sea Times that should be in your inbox soon. We will give you all the new updates of what is going on down at the Salton Sea, recent Hunky Daddy sightings, upcoming events, and tell you about the new Salton Sea historical DVD we have coming out. p.s. If you are not interested in receiving our harmless little electronic mail every few months, just reply to newsletter@saltonseadocumentary.com and write “UNSUBSCRIBE ME FROM YOUR DAMN NEWSLETTER!” in the subject line and we will take you off the list pronto. Thanks!